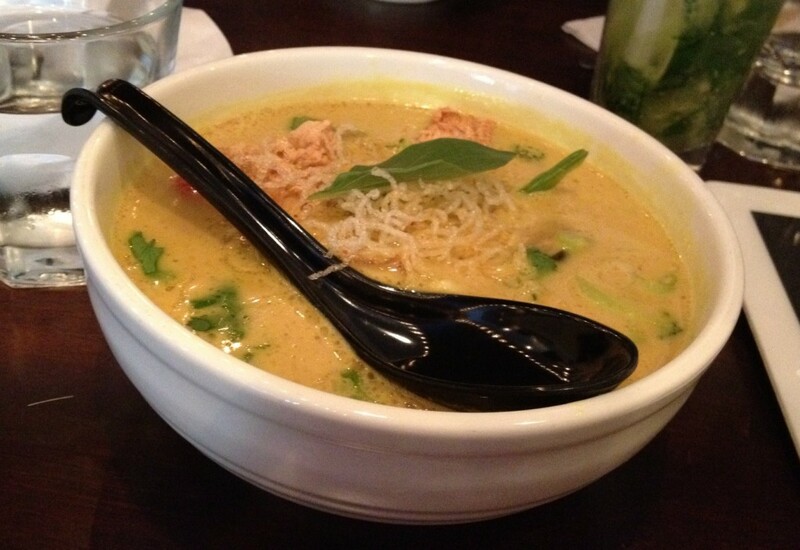 Hawker Bar on Ossington – Hey Vegan Laksa get in my mouth – vegan in your city. I work in social media/digital marketing/new media/whatever. So it delights me when I see businesses using social media effectively to connect with customers and potential customers. There is more to it than just blasting your twitter/facebook stream with self promotion, and not everyone gets that. Some businesses use it better than others. I’ve been a fan of the Poutini style of connecting with people. They get a mention, they acknowledge it, and use it to their best interest (by also including the positive comment in a reply to all of their followers.) So when @HawkerBar added me, I thought… oooh neat, another Ossington bar, I live around there, so I like having options. When I tweeted @HawkerBar: hey vegan stuff? They said sure – recommended vegan laksa, sent me a link to their menu, and it looked good. Fast forward to a few weeks later. Last night we went to a Yelp elite event (yes I Yelp – do you?) at the Gladstone. There was nothing vegan (or even vegetarian) to eat at the event, so after several free beverages courtesy of the Gladstone’s “Crappy Hour” event, JC and I wandered down the street. It was time to eat. But where? Poutini’s was the obvious choice, but I walked right on by. Plus there is the whole, devoid of nutritional value thing that comes with gravy soaked potatoes and vegan cheese (sorry folks, potatoes are great, but you can’t convince me they’re dinner.) Hawker Bar was on my mind – and besides, they’ve got non-tuberous vegetables. Hawker Bar is a small space, but when we walked in there were still a few tables available (which filled up almost immediately after we got there.) Handwritten cardboard menus, varnished log based seating, it’s cozy, but well spaced. I liked the under table hook for my purse (can more places do this please? Thanks.) I liked the friendly service. 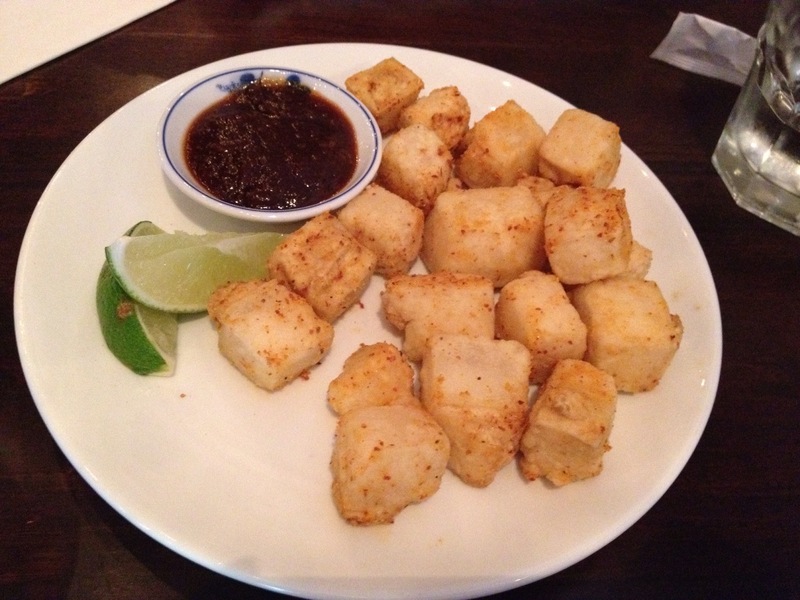 We started with the Chili Salt Tofu – a deep fried, silken tofu, slathered with chili-salt. It comes with a couple of lime wedges and a homemade BBQ sauce. Our server suggested drizzling the tofu with some lime juice and waiting for 30 seconds to let delicious flavour things happen (secret: it’s science.) It was salty and spicy – try it. Next was the Vegan Laksa. And as an aside, the vegetarian laksa comes with an egg in it, but it’s not mentioned on the menu – but really, just order the Vegan one, it’s great. Laksa is a vegetable and coconut milk based soup, with the blended flavours of galangal, turmeric, shallots, garlic, ginger, lemongrass, and kefir lime leaves (me thinks.) There were rice noodles, little tofu puffs, snow peas, chopped red pepper, and surprise eggplant bits. It’s spicy, but not too too spicy. I ordered a medium and felt like I ate it for half an hour, but JC finished his a lot sooner than I did. Small might be a bit more my size. I have no point of reference for Singaporean food or street food, beyond knowing it’s generally spicy (which is my kind of food). But one thing I do know, is that Hawker Bars vegan options made me happy, and I would totally go there again. Side note: they have cocktails. 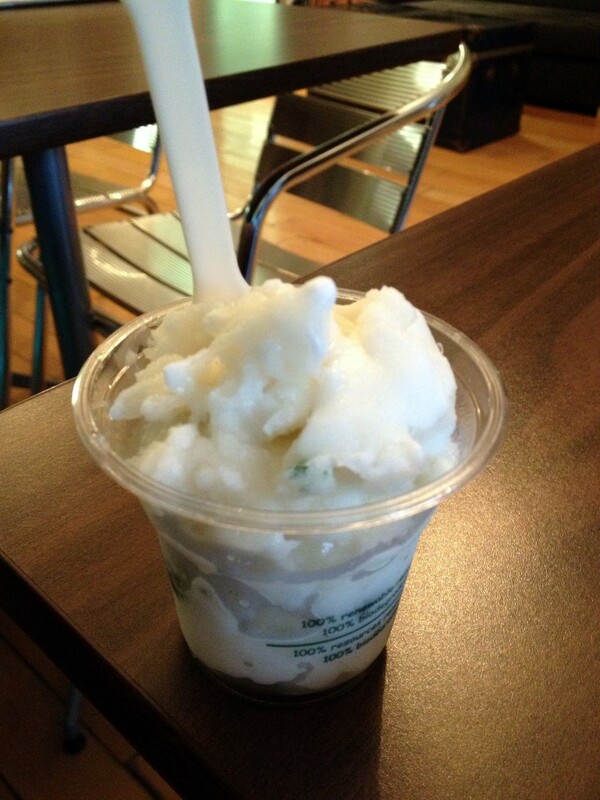 Boreal Gelato, Hawker Bar, Ossington, toronto, vegan food. Bookmark. Things I Love Thursday – Middle of June edition. wow, sounds like a great restaurant! and that food looks delicious! thanks for sharing! Oh it was so good. They even mentioned having gluten-free options!